I've hopped on the Instant Pot bandwagon and have been having the ride of my life this past week! One of the highlights of this week's experiments was this amazing Weight Watchers inspired Instant Pot Moroccan Spiced Butternut Squash Soup! Cooks in 10 minutes and is so flavorful, you won't believe you're eating a healthy soup! That's right! I got my very own Instant Pot for Christmas this year. I cracked her open last weekend and have so far used it to make 3 meals, one being this delicious soup. If you have an Instant Pot, you probably already know how simple it is to use and make things like this soup. 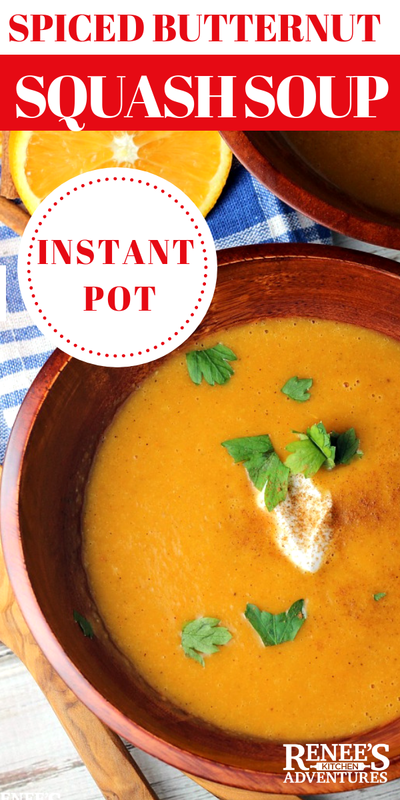 If you don't have an Instant Pot, no worries, this soup can be made on your stove top too! I also rejoined Weight Watchers this past Fall. I'll be sharing more Weight Watchers inspired recipes in this new year as I work the program again. But don't worry, I will always save room for some decadent treats too! I so love creamy comforting soup in the winter time! And, what a perfect winter this has been for soup! I'm not a winter girl at all. In fact, given a choice, I'd much rather be sweating in a hot climate than freezing in a frozen tundra. But, I find soups to be the silver lining in this season I loathe. 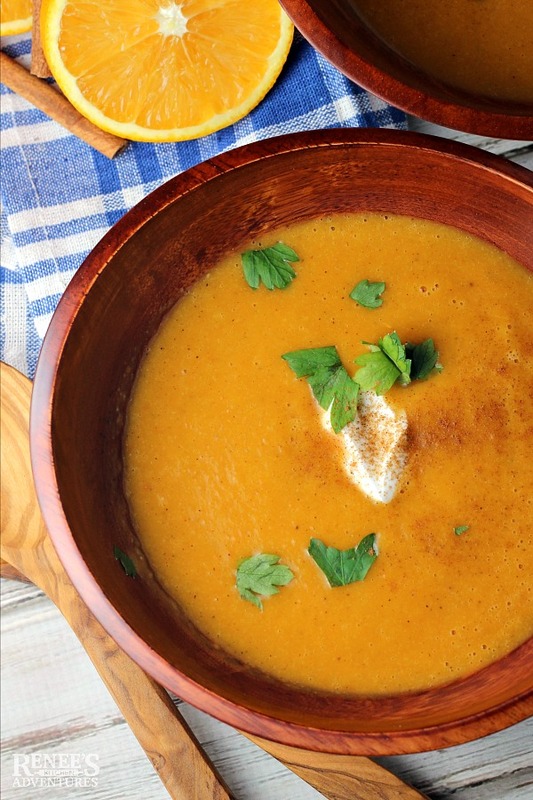 Broth soups are fine, but what really makes me happy are soups with body, like this Instant Pot Moroccan Spiced Butternut Squash Soup. There's an explosion of flavor from all the spices in this recipe and the orange juice gives it a subtle sweetness that works great with the butternut squash, carrots and onions. It feels like a hearty soup, without all the weight of calories of a hearty soup! Sub the chicken stock for vegetable broth and omit the yogurt garnish for a vegan version! Purchase pre-cut butternut squash from your grocers to make preparation easier! Add all ingredients except garnish to the metal pot liner. Put lid on and lock, set steam release handle to seal, and press pressure cook. (Make sure it's set for High Pressure. Adjust if necessary) Set timer to 10 min. Once cooked, allow a Natural Pressure Release (about 7-10 min). FOLLOW ALL GUIDELINES AND SAFETY INSTRUCTIONS INCLUDED WITH YOUR INSTANT POT! Remove lid once the pressure float valve is in the lower position. 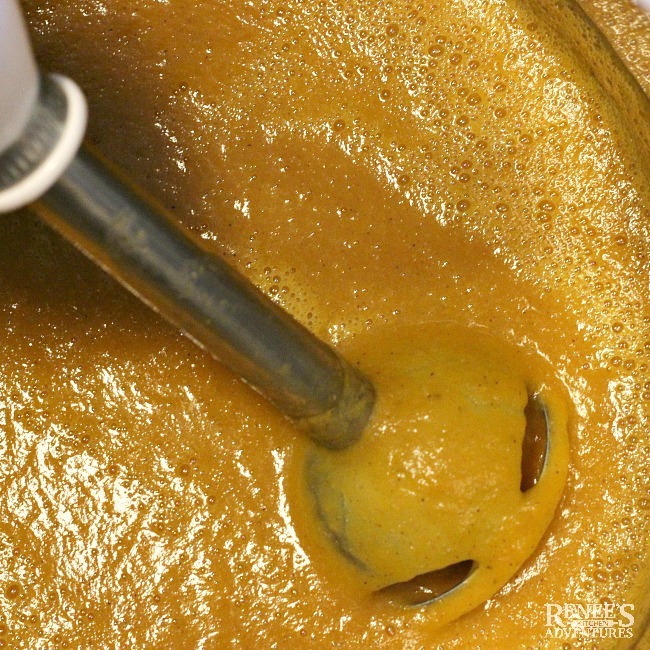 With an immersion blender, carefully blend the soup. Serve warm with a dollup of Non-fat Greek Yogurt and chopped cilantro, if desired. NOTE: This soup can also be cooked stove top. Put all ingredients except garnish in a large pot and bring mixture to a boil, then turn to a simmer and simmer until all ingredients are soft. Continue with an immersion blender as noted above. *Follow all guidelines and safety instructions included with your Instant Pot when using it! 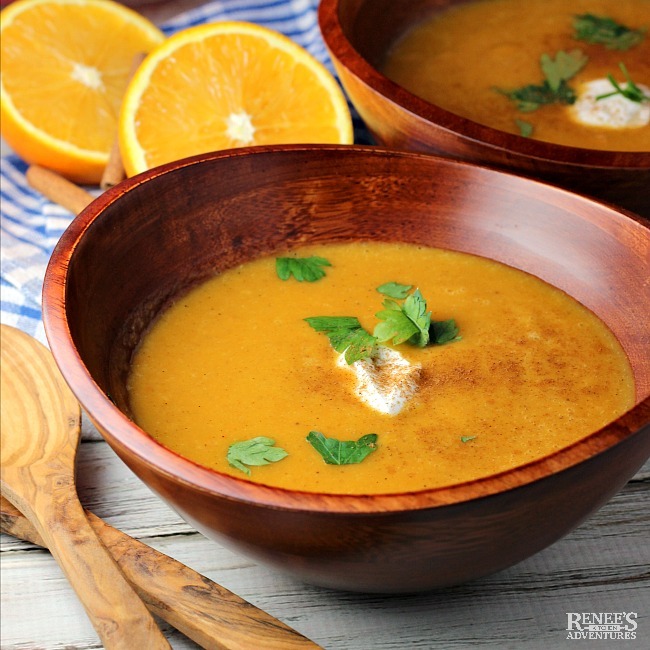 Pin Instant Pot Moroccan Spiced Butternut Squash Soup!